Shabak plays recordings of Yehuda Landsberg's children crying, still forbids contact with family or lawyer. Two more arrested. Yehuda Landsberg, a 25-year-old father of 3 from Havat Gilad in Samaria, has been held at a Shabak (Internal Security) facility over "price tag" vandalism suspicions for the last 10 days without any contact with his family or a lawyer. A source familiar with the story told Arutz Sheva about the cruel nature of Landsberg's arrest. According to the source, the young father has been harassed by Shabak agents through various means, including the playing of recordings of his children crying. After being arrested by a large police force at Yitzhar Junction early last week while on his way to a family brit milah (circumcision), Landsberg was taken to a facility in Petach Tikva, and later moved to another Shabak facility in Kishon near Haifa, according to reports. The young father is still under arrest in harsh conditions and not allowed to see his family, despite the fact that his 3 young children are defined as handicapped, given that they suffer from diseases in their blood system, reports the source. In response to the treatment, Landsberg has begun a hunger strike, a tactic that has been used by Arab terrorists to successfully secure their release in the past. On Tuesday morning, two other Havat Gilad residents were arrested by Shabak, and similarly were not allowed to meet with a lawyer or their families. 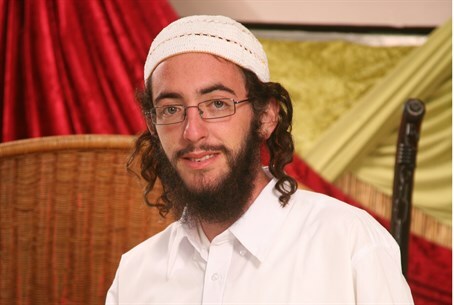 Rabbi Hillel Reines, a resident of Yitzhar in Samaria and Landsberg's father-in-law, told Arutz Sheva last Friday that police forces initially wanted to arrest his daughter and children along with Landsberg. After a debate they settled on arresting the father only. According to Rabbi Reines, Landsberg is "an honest Jew, upright, who works hard for his earnings. I don't see how he could be mixed in 'price tag' or other violent activities. They want to harass him to frighten the residents of Havat Gilad, he's their victim. But the efforts will be in vain, my daughter Emunah and the children are strong." The accusation of "price tag" vandalism being used to justify the cruel arrests come after a resident of Samaria last week exposed how Arab residents stage vandalism to blame local Jews, in perhaps the most conclusive proof to date confirming long-held accusations of framing.